As Vice President Joe Biden often said, "Show me your budget, and I'll tell you what you value." On August 15, Mayor Jacob Frey presented his proposed 2019 budget. Now it will our job - as the City Council, and as a community - to study his ideas, suggest improvements, and make our budget the best reflection of our values that it can be. My initial take: the Mayor got this budget discussion off to a great start, and deserves a lot of credit for a job well done. There's a significant investment in affordable housing, attention to racial equity in home ownership, business ownership, and financial power, civilianization of some police roles that could be better performed by specialists than by sworn officers, investments in clean energy, supportive for community public schools, and new approaches to snow removal, among just a few of the priorities from his today's speech. Because of anticipated revenue from the new licensing fee schedule approved last month, and a sustained pace of growth, Mayor Frey was able to propose these investments with a relatively modest levy increase of 5.63%. A homeowner whose property value stays the same for 2019 would actually see their property taxes go down, not up. Since we initially thought that investments like these would have required a levy increase twice as high, I'm glad that's where we're starting the conversation. You can see the details online this year as we strive to make the budget process more transparent than it's ever been. I'm very interested to hear your feedback, and to work with you in the coming months to hone this document into the budget our city needs and deserves. Email me at Steve.Fletcher@minneapolismn.gov or send me a comment on my Ward webpage. We recently updated the Ward 3 webpage on the City website, and I encourage you to take a look. Whether you're looking to get in touch with me or my Council Office, or find out specific information about a City process or project, I want my City Council webpage to be a go-to resource for everyone in Ward 3. We have added an interactive map of Ward 3 resources and landmarks, and a new City Resources page with links to commonly-requested information. Take a look, and if there's something missing here that you think would make a useful addition, send me those ideas. For more news and updates from me and my office, please follow me on Facebook and on Twitter! As your City Council Member, one of my top priorities since taking office has been to support the creation and development of quality jobs and small businesses in every part of Minneapolis. I sit on the Economic Development and Regulatory Services Committee, and I strongly support the work of our Business Development team and Small Business team. I want to find out more about the businesses that are already operating in our Ward, so I am requesting your participation in a short survey that I am conducting out of my Council office. Your responses will help give us a better understanding of the economic activity in the Ward and how the City of Minneapolis can help your business thrive. This survey is entirely voluntary, and we will not publish any individual responses without your permission; only aggregate data. It should take approximately 5-10 minutes to complete. You can access the survey online via Google Forms at this URL: https://bit.ly/2mGP4JA. I would greatly appreciate your participation. Mayor Jacob Frey joined Native American community leaders, social service providers and other government partners in announcing an action plan to help people living in a growing homeless encampment near Hiawatha and Cedar avenues in south Minneapolis. Aug. 23 through Aug. 31: The focus remained on harm reduction at the encampment and meeting the emergency needs of residents related to safety and health. September: Extensive outreach will continue to connect people with critical resources. An offsite location will be established with showers, bathrooms, medical personnel and housing service providers to serve members of the encampment. At the end of September, the encampment will close. Oct. 1 - Dec. 1: The coalition will continue to provide housing placement and medical support for community members. Community and government partners will also focus work on long-term strategies to address housing stability, health concerns and the opioid epidemic. This includes the continued work of the Mayor’s Multi-Jurisdictional Task Force on Opioids and the convening of a housing stability task force. The community response to the encampment has been swift and generous. Leaders within the Native American community are organizing donation collections. Find out how to help at franklinhiawathacamp.org. I was so glad to be able to take part in the ceremony celebrating the opening of Samatar Crossing on August 23! 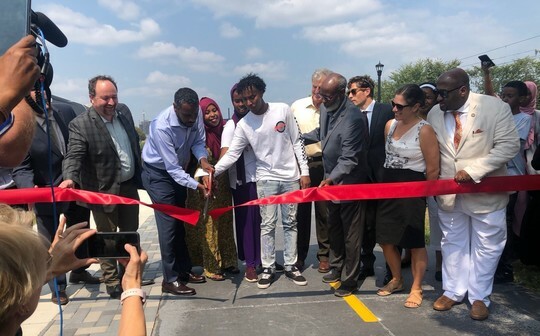 This is a beautiful connection between the Cedar-Riverside community and Downtown, and a beautiful legacy for Hussein Samatar, who worked tirelessly to build bridges between communities. It was an honor to stand beside Hussein’s family, Mayor Jacob Frey, Council President Lisa Bender, Council Member Abdi Warsame, Transportation and Public Works Chair Kevin Reich, and all of the Public Works staff who made this a reality. The City’s Public Works Department repurposed the former Fifth Street exit ramp to downtown Minneapolis into a welcoming pathway over Interstate 35W. Samatar Crossing features separate pathways for people walking and biking and new pedestrian-scale lighting. There are also plans for additional landscaping and public art along the crossing between 11th Avenue South and 15th Avenue South. The City has issued a call for artists and seeks up to three artists to collaborate on the design of an iconic public artwork for the crossing. Samatar Crossing is named after the late Hussein Samatar, a former Minneapolis School Board member and the first Somali-American elected to public office in Minneapolis. On August 16, the Public Utilities Commission voted unanimously to order Xcel Energy to terminate their grant contract with Crown Hydro. This is a significant victory for our community, and communicates clearly what we've been saying for a long time: that Crown Hydro's proposal is incompatible with the city's vision for a river that is accessible to everyone as a community benefit for all. Both Mayor Jacob Frey and I have worked with our city's Intergovernmental Relations staff to achieve this ruling, and I'm hopeful that it signals a turning point in the fight against Crown Hydro's ill-conceived proposal. I'm grateful for the work of many in our community - especially Kjersti Monson and Friends of the Lock & Dam - who have worked to raise awareness on this issue and build a vision for what that stretch of river could mean to our community. I'll keep working to protect and improve a riverfront we can all enjoy. Minneapolis served 93,534 voters in the August 14 primary election - the city’s highest turnout in a midterm primary since 1970! Absentee ballots accounted for nearly 16 percent of total turnout this year, a sizeable increase compared to prior midterm election years, though most voters continued to cast ballots on the day of the primary. Minneapolis voters cast 78,540 ballots at the polls on Election Day, accounting for 84 percent of the final tally. The City of Minneapolis Elections & Voter Services Division needs temporary election judges up to full-time from October 9 to November 9, 2018. We are opening multiple Early Vote Centers for the week before Election Day (Tuesday, October 30, through Monday, November 5) and need election team members who will train for up to three weeks, then serve voters at one of four Early Vote Center sites. In addition, Elections & Voter Services needs staff for mail, Absentee Ballot Board, and warehouse operations during this period. These roles require strict attention to detail and comfort assisting and serving diverse populations and languages. Second-language fluency in Hmong, Oromo, Somali, or Spanish is particularly desired. If you are interested in this temporary position, please fill out the short application for the Seasonal Elections Support Specialist I position! Minneapolis Public Works is also teaming up with Hennepin County this year, offering new counting locations outside of Minneapolis in first-ring suburbs. If you are interested, you can register online by visiting www.menti.com and entering the code 67 00 90 or by contacting Emily Kettell at Emily.Kettell@hennepin.us or 612-543-1963. The City of Minneapolis has entered into a settlement agreement with the McDonald’s franchise at 210 E. Lake St. to ensure workers are paid more than $20,000 in back wages and penalties owed under the City’s minimum wage ordinance. The City’s Civil Rights Department discovered widespread underpayment of wages at the McDonald’s location after being alerted to the problem by community partners. The Civil Rights Department will conduct a training for managers at the fast food restaurant. A separate roundtable discussion with ownership, managers and workers is also required as part of the settlement, creating a safe space for all to discuss workplace concerns. The City’s minimum wage ordinance took effect Jan. 1, 2018, requiring large businesses with more than 100 employees to pay workers $10 an hour. On July 1, 2018, the minimum wage in Minneapolis increased to $11.25 for large employers and $10.25 for small employers (with fewer than 100 workers). The tiered phase-in schedule requires large businesses to pay a $15 minimum wage by 2022 and small businesses by 2024. Violations of the minimum wage ordinance can be reported by calling 311 or filling out an online form, or in person at City Hall, Room 239. The ordinance supports the City’s goals of promoting inclusive economic growth by reducing economic and racial disparities. For more information about the ordinance, visit minimumwage.minneapolismn.gov, call 311 or email minwage@minneapolismn.gov. 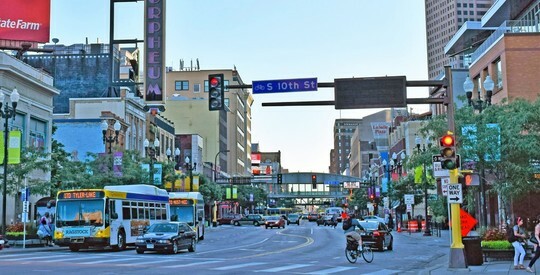 The City Council has approved the layout for a reconstruction of Hennepin Avenue from Washington Avenue South to 12th Street — a redesign intended to make the street more functional for all travel modes. The layout is consistent with a concept developed and approved by the City Council in 2016. One-way protected bikeways in both travel directions. Four vehicle lanes, with Hennepin Avenue remaining a two-way street. A narrowed roadway, which will reduce the crossing distance for pedestrians. A consolidation of bus stops from 13 to eight. The project team will now begin a detailed design phase and continue community engagement. For more information and to sign up for project updates, visit the Hennepin Downtown project website. 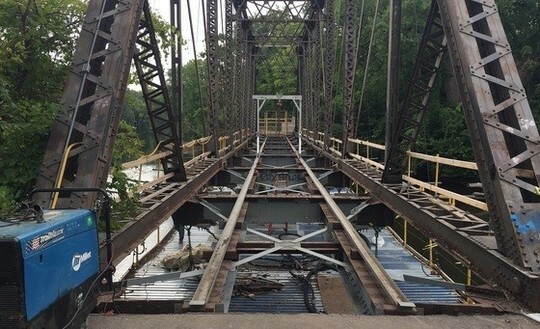 The Boom Island-Nicollet Island Bridge rehabilitation project is making good progress, although long lead times for steel and timber decking did cause some delay. The bridge is still expected to reopen this fall, likely in early October. Steel repairs continue this week with sandblasting and painting of the lower steel structure, followed by deck installation on half of the bridge in the coming weeks. Please continue to follow the posted pedestrian and bike detours and stay out of the construction area. The Mississippi River East Channel below the bridge is closed to all boat traffic until the bridge reopens, so the Paddle Share kayak return station has been relocated to the Boom Island Boat Launch. You can visit the project webpage here. The City of Minneapolis and the City’s Open Streets event organizer, Our Streets Minneapolis, are seeking route ideas for the 2019 season. Applications are due Sept. 21. Applicants can also share their interest in being a local route host. Routes that have had Open Streets events for the last two years do not need to apply for 2019 and will be considered along with other route ideas. Open Streets Minneapolis encourages people to contact Nick Ray Olson, the organization’s event and program director, at 612-785-0722 or nickray@ourstreetsmpls.org before submitting a route idea. Goals for Open Street Minneapolis events include fostering community connections, celebrating the city’s diversity, inspiring healthy living, supporting local businesses and promoting active transportation. More than 101,000 people participated in Open Streets events in 2017. For more information on this year’s events, visit www.openstreetsmpls.org. Join me for my next Good Morning Ward 3 on Wednesday, September 26! Our guest speaker will be Minneapolis Fire Department Chief John Fruetel, who will discuss plans for a new Mobile Health Care Provider pilot program and a Mobile Integrated Healthcare study in partnership with Hennepin County to provide a variety of healthcare and social services to our city. Wednesday, September 26 from 7:30 - 9:00 a.m.
All are welcome! RSVP on Facebook or just show up. If you want to discuss a specific issue or project, email matthew.crockett@minneapolismn.gov and we'll add you to the agenda.